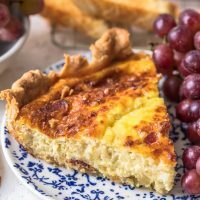 This Quiche Lorraine recipe is perfect for breakfast, brunch, or lunch. The pastry crust is filled with an egg & cream mixture full of bacon and cheese! ½ 14.1-ounce package store-bought pie crusts. For ease in rolling out, remove pie crust from refrigerator 20 minutes before using. Fit one pastry crust into a 9-inch pie plate, cover and rest in the refrigerator until oven has preheated. Pre-bake store-bought pie crust according to package directions (approximately 10 minutes); set aside to cool. While crust bakes, prepare the bacon by cutting the strips into ¼” slices. Place the bacon in a cold skillet set over medium-low heat and cook until crisp; drain on a paper towel-lined plate. Set oven temperature to 375°F. In a medium bowl, combine the Swiss, Gruyere and Parmesan cheeses and bacon. Toss to mix. In a different medium bowl, whisk together eggs and add the cream, half-and-half, nutmeg, black pepper and kosher salt. To assemble the quiche: Sprinkle the cooled crust with half the cheese/bacon mixture, pour half the egg/cream mixture on top, sprinkle with the remaining half of the cheese/bacon mixture and finish with the remaining half of the egg/cream mixture. Bake at 375°F for 30-45 minutes or until set in the middle. Cover the crust edge after 30 minutes to prevent burning. Serve with a side salad and buttered warm baguette. Enjoy!